Last June I had surgery on my knee to repair lateral and medial tears on my meniscus. 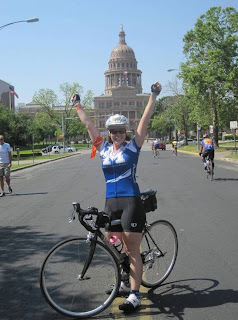 I continued coaching Katy Fit (the group I trained with for the marathon in 2010), but did not get into Houston and was not recovering like I had hoped. So instead of running I decided to take up road biking – and what better way for an amateur to jump in, but to commit to riding over 160 miles in the BP MS 150, a two-day ride from Houston to Austin to raise money for multiple sclerosis. 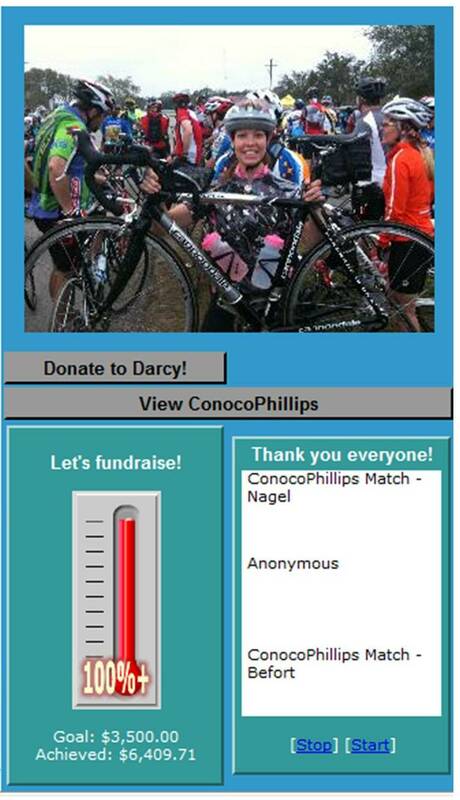 I purchased a road bike online in October 2010 and joined the ConocoPhillips training series and began riding in January of this year. Fortunately, I had a couple of close friends that also decided to ride making carpooling easy and I quickly joined a group of experienced riders I knew from work and so began my journey. I absolutely love road biking – it’s so different from running and when asked which I love more I am at a loss. There are aspects that I love about both sports and the challenges they present. As part of the BP MS 150 every rider is required to raise a minimum of $250. I set my goal at this level when I began, but after spending a good portion of a ride talking to a gentleman who had MS and was out there riding, I decided to change my goal. Reach for the moon and you’ll land among the stars, right? I chose $3500, Top Fundraiser level, as my new objective. This week I saw an email from the MS Society encouraging everyone to finish getting their donations in – that the 300th person was at $6020. I thought to myself, wow, I hope that I can do that next year and be in that group. Then on Friday, I received another email from the MS Society. This one I was used to seeing, but it hadn’t made an appearance in my inbox since before the MS 150. It has the subject line “A donation has been made on your behalf…”. I hurriedly open the email wondering who would have donated so late after my last update on how the MS 150 ride went (the ride was in April). When I opened that email I was met with a surprise that literally brought me to tears in my office and caused my heart to race. The donation made on my behalf was $2000!! 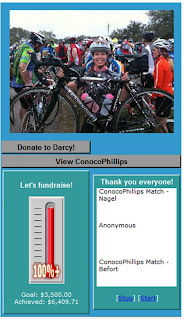 I couldn’t believe what I was seeing and quickly got onto my fundraising website to make sure I wasn’t seeing things. Sure enough, I had an updated total of $6400! I called a friend in my close riding group and he explained to me that whenever ConocoPhillips has money leftover from the training series that was not used on food or was collected from late payments, etc., they give it back to the MS Society. He said that everyone was impressed with how great a rider I was and how much money I had raised in my first year. He said that now I am in the Club 300 group where I belong. I was so moved by his kind words and overwhelmed with amazement at everyone who helped me reach that goal – my friends, family, and co-workers that contributed my financially, my husband who supported me taking on this challenge and spent the entire weekend cheering me on and helping me, and my riding group who encouraged me and gave me their tips and tricks on riding. I am so thankful and blessed and proud to say that I will be in the Club 300 when I ride the MS 150 in 2012!!! Below are all of the letters that I sent during my training as well as the final letter recapping the weekend of the MS 150 ride (and hopefully they are legible as I embed them as PDF documents...). Enjoy!